Are all your emails, appointments, notes and TODO list stored in Outlook ? If you cannot imagine a life without Microsoft Outlook, here's a software called Outlook on the Desktop that you will immediately fall in love with. Outlook on the Desktop lets you replace your boring Desktop Wallpaper with a live view of our your Outlook Calendar appointments and events, emails in your Inbox or the pending items in your TODO list. 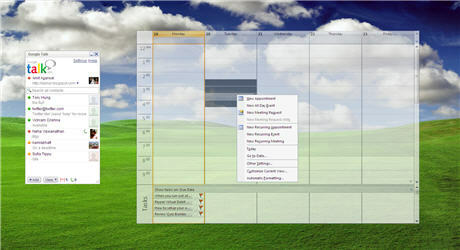 And this ain't any static wallpaper - you can add new appointments, reply to email messages or clear pending tasks just like you would do inside Outlook. The program even lets you set the opacity levels so that desktop icons in the background are also visible.